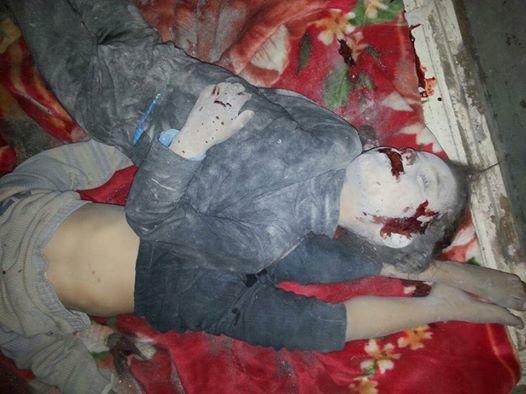 Two young boys, whose names I do not know, killed by American bombs in Harem, Syria, in November, 2014. It is rare to see such images in American media. The killings at the office of Charlie Hebdo in Paris are abhorrent. But let us not forget the daily abhorrence of our wars in the Muslim World, wars that have seen over a million Afghans, Iraqis, Libyans, Pakistanis, Somalis, Syrians and Yemenis killed and millions more wounded and maimed physically and psychologically, while millions of men, women and children endure another cold winter, homeless and hungry. So as we question and fume, shocked and aggrieved at the hateful killing of journalists and satirists, police officers and a janitor, we should not be so insensible as to not acknowledge the horrid cost we have exacted on the populations of the Greater Middle East in pursuit of democracy, freedom and liberty; campaigns undertaken in the name of our values that are executed in the very manner as those murderers in Paris on Wednesday proselytized and witnessed their faith as Muslims. We must recognize the extremists and war-mongerers in our societies, who like the members of al-Qaeda and the Islamic State, want war and require war to justify their own cosmic, religious and Manichean world views, or profit from the bounty of being an empire that has over 700 military bases around the world and sells nearly three-quarters of the world’s arms. For to believe that the attack in Paris was a tragedy singularly about a cartoon or as an event solely to be defined as an assault on freedom of expression, is to be daft and incongruent with the history and reality of American and Western policy in the Middle East. For decades, American and Western policy, through action and subsequent backlash, has provided the world and, most sordidly, Muslims with such Frankensteins as the Saudi Royal Family, the Shah of Iran, Saddam Hussein, Hosni Mubarak, al Qaeda, the Taliban, and, now, the Islamic State. What played out and ended with the sickening execution of a wounded policeman on a Paris sidewalk is a direct outgrowth of American and Western policies to try and manipulate sects, tribes, ethnicities and religions in the Middle East to preserve or remove regimes in an absurd and defiled real life version of the board game Risk. It is a game that makes sense to very few outside of Washington, DC and London, but serves to validate and enrich a $1 trillion dollar a year US national security and intelligence industry, while making composite and real the propaganda and recruitment fantasies of al Qaeda, the Islamic State and other extremist groups that are parasites of war. So I stand with Charlie, but I also stand with all those millions of voiceless victims of our wars and our policies in the Middle East. To do other, to condemn the killings of innocents in our lands, without offering the same condemnation of our government’s killings in their lands, is not just a cruel blindness to the human suffering inflicted by our own machines of war and their munitions; but it is unwise, because what we saw this week in Paris is just one other moment in the ever-continuing, never-ending cycle of violence between the Western and Muslim worlds. Those in the West who proclaim the defense of democracy, freedom and liberty as justification for our bombings in the Middle East are of the same ilk, cloth and substance as those whose corrupted interpretations of Islam leads to slaughter on Western streets and genocide in Muslim lands. Stand with Charlie Hebdo, stand with our Muslim brothers, sisters and their children, and stand against the purveyors of hate and war in all societies.